Lucie had been looking forward to our next fennel cooking event. I had not. 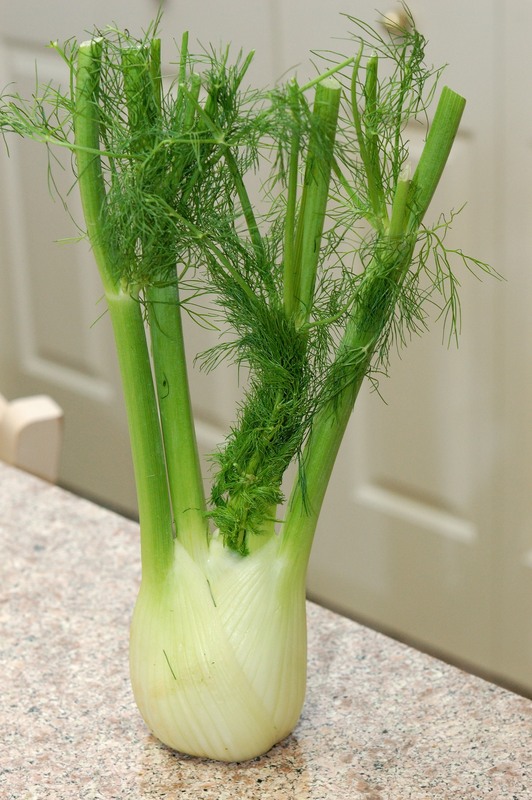 I was pretty sure that I would not like fennel, no matter what we did to it. Lucie chose a recipe for Fontina, Fennel and Onion Pizza from Martha Stewart and I chose Green Beans with Sauteed Fennel from cooksmart.com. Lucie’s choice seemed hopeful. Add enough fontina cheese to something, and it will probably be at least edible. I was hoping that more green beans and less fennel would the make recipe I chose tolerable. 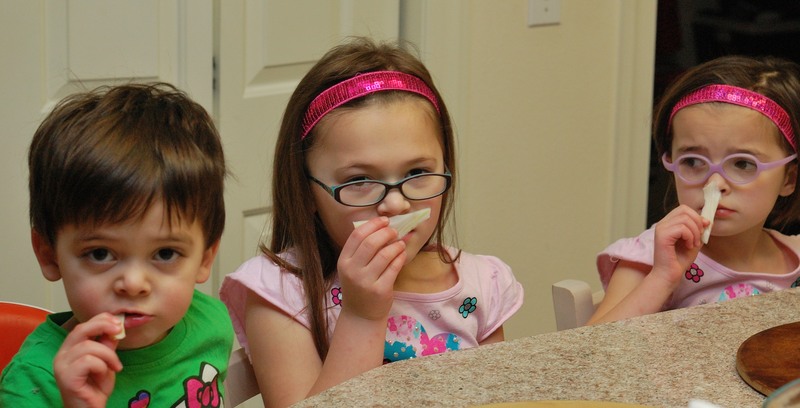 I thought it would be a good idea for the kids to taste raw fennel. Does Josie look worried? She may have taken a small bite. She definitely gave raw fennel two thumbs down. Lucie took a bite and decided she did not like it. Theo gobbled his up, smiling the whole time. After hearing what his sisters thought, he decided on a negative rating. I think he may have been influenced by popular opinion. Dave thought it tasted like raw celery with some flavor and said he would eat it as a snack. I had my bite of raw fennel on Sunday and I wasn’t going to try it again. We started with the pizza. I used a pizza dough recipe that I saw online this morning from the Wall Street Journal. I made it according to the directions. 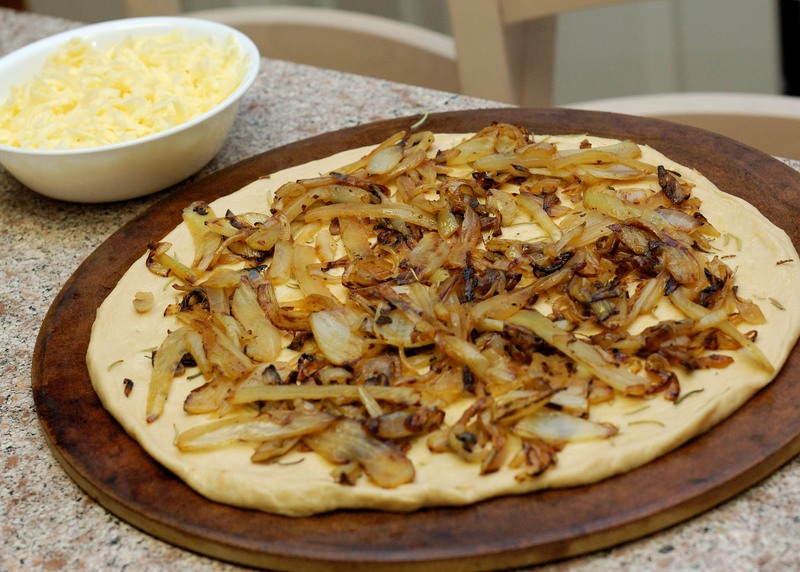 Then, I prepared the Caramelized Fennel and Onions for the pizza. I have to admit, the fennel started smelling better when combined with onions. 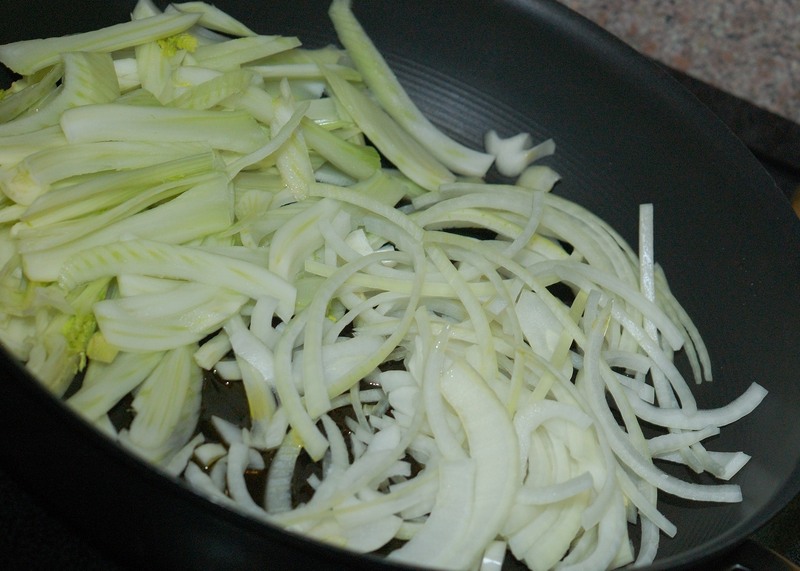 While they were cooking, the fennel and onions began to smell wonderful. 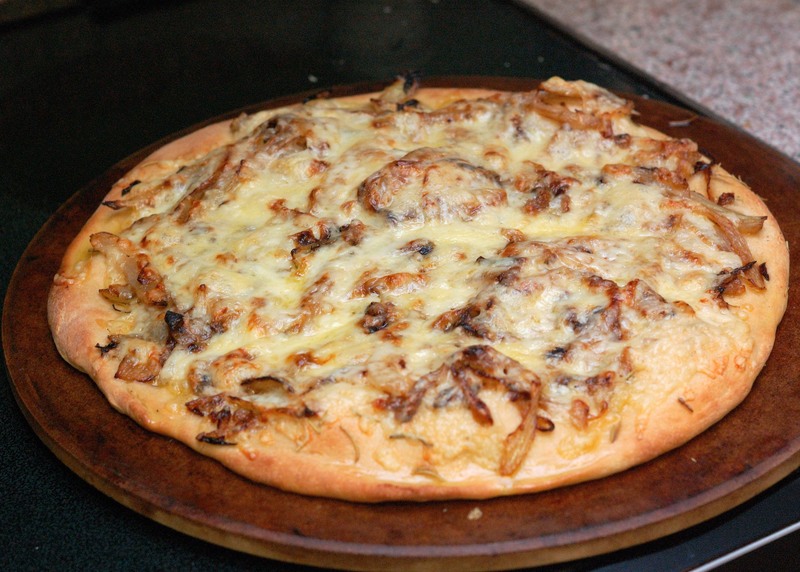 After drizzling the pizza crust with the herb olive oil, I added the fennel and onions and then topped it with shredded fontina cheese. Yum! I was thinking, “Surely fontina cheese will make fennel tolerable.” Martha Stewart’s recipe calls for adding some fennel fronds on top of the pizza. I decided to leave this off. No need to get crazy with the fennel. Theo wandered into the kitchen. He wondered what was cooking, but decided against sampling any of the cooked veggies. We baked the pizza on a pizza stone at 500 degrees F until the crust was golden and the cheese was bubbly. While the pizza was baking, I made the Green Beans with Sauteed Fennel. This recipe, presented by Jess on cooksmarts.com, was very quick and easy to make. 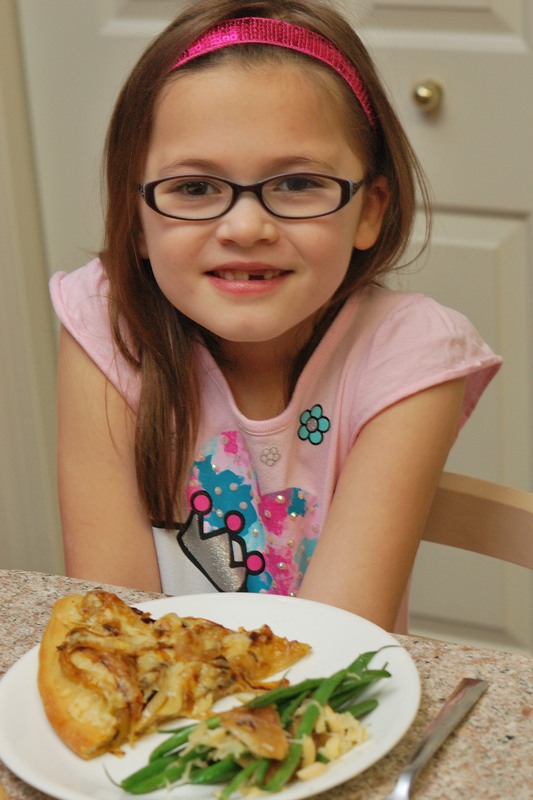 By the time the green beans were ready, the pizza was ready, too. Lucie was very excited to begin tasting. Josie refused to enter the kitchen. That bit of raw fennel was a shock to her system. Poor Joz. Theo’s supper was bread sticks made from the other half of the pizza dough recipe, since both of these recipes contained dairy. I’m pretty sure he would not have eaten them, even if they had been dairy-free. Lucie loved the pizza and gave it two thumbs up. 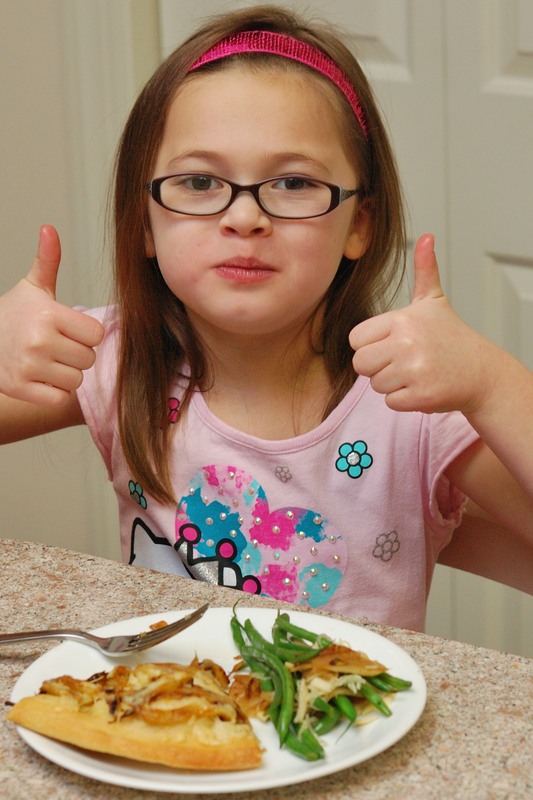 She gave the green beans with sauteed fennel two thumbs to the side. This means she didn’t mind taking a few bites, but she didn’t really like it. Josie finally decided to try a few bites. She ate the pizza after picking off the fennel. She tried a bit of the green beans, but that was it. Dave and I loved both of the fennel recipes that we tried today. I even like the fennel pieces in the green beans. The flavors seem to complement one another and I didn’t notice the licorice taste at all. I think we will make both of these recipes in the future. I am really surprised to be saying that! Don’t forget to follow us on Pinterest if you want to see more veggie recipes that we are exploring. 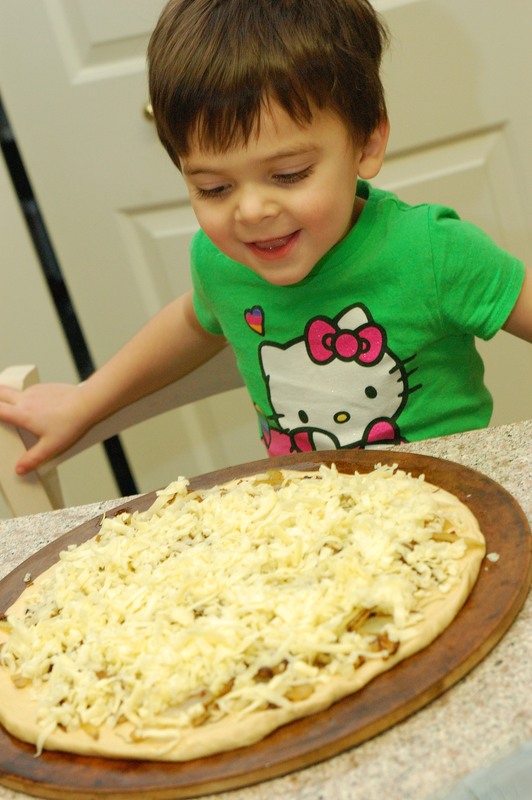 We tried two new recipes. We tried green beans with fennel. We also tried fennel pizza. I give the green beans with fennel two thumbs to the side. I give the fennel pizza two thumbs up. I tried raw fennel, too. I give raw fennel two thumbs down. I really like that we are trying new vegetables and recipes. 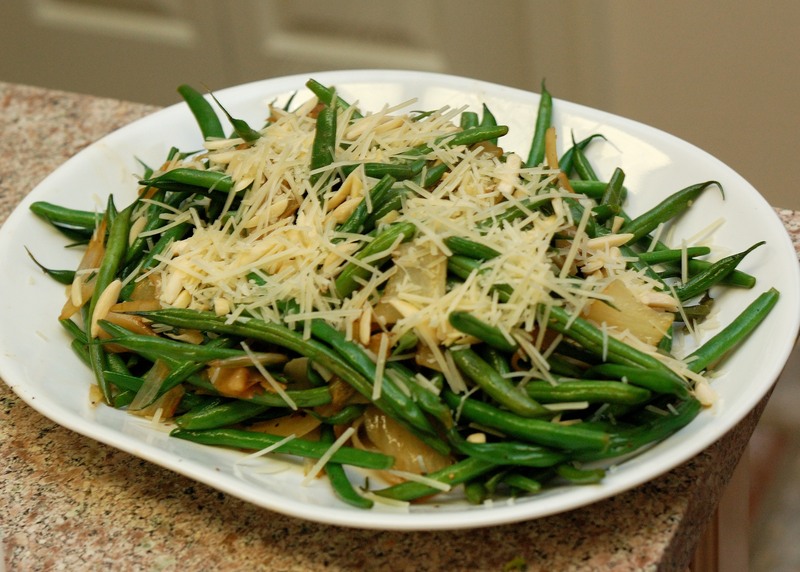 Categories: Fennel | Tags: fennel, fontina cheese, green beans, pizza | Permalink.